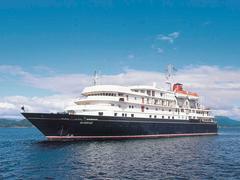 In April 2009 we reported that Peter Thompson and Michael White of Ocean Independence had sold the 90m mini-cruise ship Hebridean Spirit and now Peter tells me that she's back on the market under the new name Sunrise. Built by Italy's Cantieri Apuania in 1991, she was rebuilt in 2001 and is currently undergoing another major refit. Peter says that she's an ideal platform for private use or as a six star cruise operation, sleeping up to 120 guests in 60 cabins. Maintained to SOLAS standards and Lloyds classed, Sunrise is asking €29.5 million.